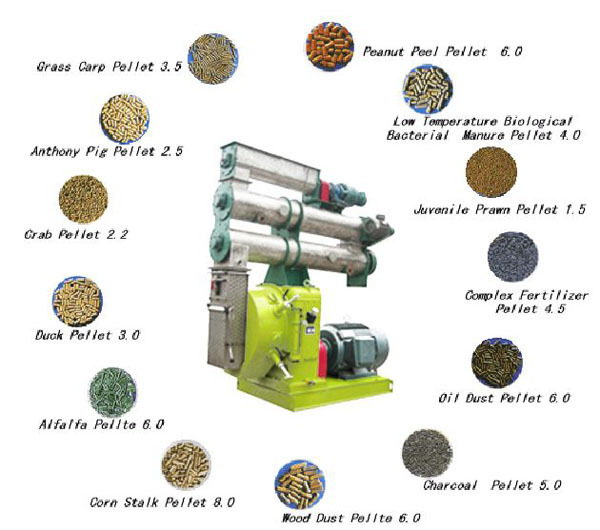 The above pic show various applications of feed pellet mill pelleter. It can process kinds of biomass pellets such as alfalfa pellet, corn stalk pellet, wood dust pellet, charcoal pellet, oil dust pellet, peanut peel pellet. It can also process complex fertilizer pellet, duck pellets, grass carp pellet, anthony pig pellet, low temperature biological bacterial manure pellet, juvenile prawn pellet etc. The diameter of pellets can be 2.2mm, 2.5mm, 3.5mm, 4.0mm, 5.0mm, 6.0mm and any specification as clients required. On the basis of introducing, studying and absorbing the matured biomass pellet forming technology from Europe, Kmec took the head in developing and innovating successfully the technology and complete system of biomass pellet forming in China. The production system can adapt various kinds of biomass material that has been pretreated, thus various kinds of barks and branches of trees and also wood shavings etc. can all be formed into pellet fuel. The formed pellet fuel has such advantage as shining smooth surface, high density, uniform length and crackless surface, and all of the technical parameters have reached the international standard.